Well, my liberty loving friends, it’s finally happened. 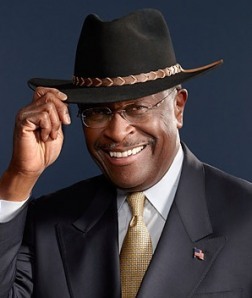 Herman Cain has taken his hat out of the ring in the race to win the Republican nomination. This is a fitting phrase because, as you know, Herman loves to wear some fancy hats. Damn, that is one spectacular cowboy hat. Herman Cain ran one of the most unorthodox, entertaining campaigns that I have witnessed in my lifetime. In the beginning, Cain was a long shot that provided little more than witty comments during otherwise uninteresting debates. He was thrust into the spotlight after having a strong debate performance (which Marc provided commentary to here), which was promptly followed by a Florida straw poll victory. After the straw poll victory the media anointed Cain a “Top Tier” candidate. Satisfied that Cain had secured his place in the media spotlight his campaign wasted no time producing the most awkward and hilarious campaign ads. We provided coverage of the insanity here and here. When we look back on Herman Cain’s campaign, most people won’t remember his stylish hats or his comical internet campaign ads. They will remember the accusations of his alleged inappropriate behavior towards women. We didn’t cover these accusations of inappropriate touching or extramarital affairs extensively here at Lions of Liberty. The main stream media always provides more than adequate coverage on topics of that nature. This blog’s primary focus is on promoting the ideas of liberty, examining current and proposed policies, and adding some necessary laughter to an otherwise dull political landscape. I provided some analysis of Herman Cain’s policies in a previous post. In that post, I was not too friendly to Herman’s policies and I have not softened my stance since then. He labeled himself as a business man and Washington outsider. This was a dishonest representation of a man who was Chairman at the Kansas City Federal Reserve and head of the powerful National Restaurant Association lobbying firm. In my opinion, Herman Cain was able to fool much of the Tea Party into thinking that he was a Washington outsider. It appears that Herman is not finished being dishonest with his dedicated supporters. The rumor in Washington is that Herman Cain is going to endorse the ultimate Washington insider, Newt Gingrich. Say it ain’t so Herman….